What’s more fun than 5 weekends in one month? We don’t know. So to celebrate, I am posting a video on Autodesk 3ds Max each Friday in March. The first one I am starting with is about Ambient Occlusion (or AO). 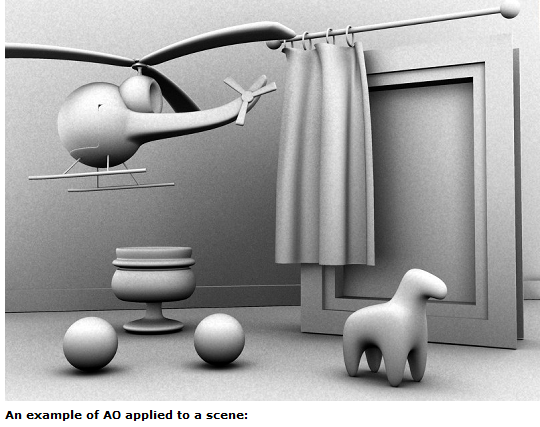 AO is a “Fast Approximated” method of calculating “global illumination” or in layman’s terms, the way light radiates in real-life. It is sometimes called “Sky light” method. It’s not the shadows caused by direct light but the shadows caused by indirect (bounced) light. Rather than using a ray trace or some accurate but slow way of calculating soft ground shadows, it approximates the way shadows cast on a cloudy day. Renderers love this because of the speed! Play the video and see how quick the image can render. I hope you enjoy it. Remember, I am adding another video each Friday this month, so subscribe in the upper right corner or bookmark this for next week.